This book explores the legal issues inherent in resolving troubled banking sectors in transitional economies. Bank failures are a recurrent phenomenon in both developed and developing countries, as shown by the crises in the last ten years in the USA, Japan, Scandinavian countries, the Baltic countries, Bulgaria, South East Asia and Latin America. Banks in transitional economies face additional challenges as they become intermediaries in lending the public's savings, rather than mere conduits for the central financing plan. They have to ensure repayment of loans when they no longer receive subsidies to compensate their losses to the same degree as before. As a result of these challenges, almost all these countries have suffered numerous bank failures in the past eight years, with negative consequences for bank owners, managers, depositors and other creditors. The absence, in many situations, of appropriate crisis management procedures and bank insolvency laws hinders the success or pace of the transition process. This book is the result of a research seminar organised by the Centre for Commercial Law Studies, Queen Mary and Westfield College, University of London, and the Office of the General Counsel of the European Bank for Reconstruction and Development (EBRD). 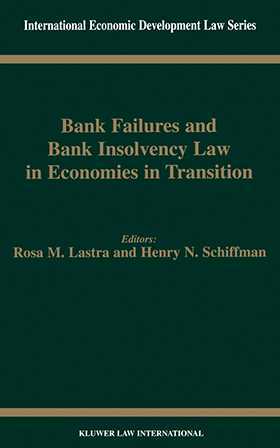 The authors include distinguished US and European professors of banking law, government policymakers, prominent lawyers and economists from the European Union, the EBRD and the International Monetary Fund, and senior industry executives from law firms and financial institutions.